A growing group of young, ambitious early-career professionals are among today’s foot soldiers of the Loaned Executives program, a longtime component of the annual fundraising campaign for United Way of Delaware County but one that had waned over the years. These are the men and women whose job is to make the ask. 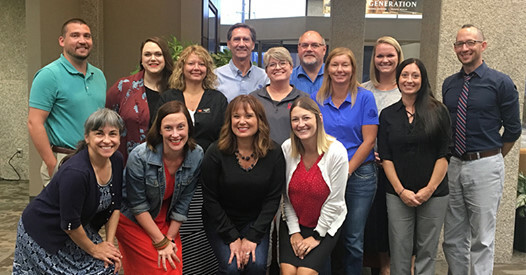 Once the domain of community stalwarts, the last two years has birthed a new generation of United Way pitch men and women – many of whom are new to United Way. They meet with company CEOs and small business owners to tell the United Way story. In Delaware County, nearly half live in poverty; in the city, it’s six in 10 families whose low income fits the federal guidelines for poor. A recently released report shows more children in Delaware County live in poverty than any other county in the state. It’s a generational problem that United Way has taken aim at through its support of early childhood education, specifically programs that increase third-grade level reading attainment, a key benchmark for success later in life. As grim as those statistics may sound, the money raised for United Way supports 28 programs raise money for 26 nonprofits throughout the county that have a tie to the central goal of ending generational poverty. Ball State University Associate Professor Kristen McCauliff and Muncie native, Voices United performer and entrepreneur Jennifer Stanley are the first lieutenants of the Loaned Executives, and they’ve developed programming fit for a world class sales operation. The skills the “LEs,” as they are called, learn in a series of workshops not only will benefit the United Way fundraising campaign but the loaned executives will return to their employers with sharpened skills and more focus about who they are and what they can achieve when they have a purpose in mind. It is that “power of purpose” that one presenter, Wil Davis, co-founder of Ontario Systems and now President of Ball State’s Innovation Corp., used to inspire the loaned executives. Davis, who also is founder and principal for his consultant company, Noble Why, helps organizations foster passionate, purposeful, and productive cultures – a Cultures of Excellence – where there is both an individual and collective pride in the work being accomplished. Such intention is what ultimately will bring positive change to the community, she said. That’s why after every training session, there’s a happy hour in a local pub or brewery. Jeff Lang, the 2018 campaign chair, says his first foray into community life in Muncie when he moved here in the ‘90s was as a loaned executive. The connections made then paid off later. His networking benefited the community but it also benefited himself, personally. “United Way is solving problems with a depth and breadth that not everyone knows about,” Stanley said. The men and women from companies all over the community are telling the United Way story, and they’re engaging with others like themselves, who have ambitions like themselves, who want to live a life of purpose, like they do. Voices (Re) United take stage to end generational poverty. Want to stay up to date? You can receive monthly updates on United Way's work in Delaware and Henry Counties.